Building an effective EHR Governance and support model is critical to organizations preparing to implement a new electronic health record (EHR). However, having a strong governance and support structure is equally vital post-launch to ensure that ongoing optimization of the EHR supports the organization’s changing needs. The benefits of implementing a new EHR are usually clear and have internal support for implementation. Where many organizations struggle is in creating a sustainable internal governance and support structure for their EHR. Without such a model in place, the EHR often isn’t well maintained, and program staff uses other processes to track new requirements. Most organizations have only one or two staff (EHR manager and analyst) dedicated to managing the EHR implementation and providing ongoing support. This limited approach is seldom efficient or sustainable and can significantly impede the organization’s ability to grow and adjust the system configuration. Leaders “own” their system (EHR) and have made collaborative decisions about how it will be used to advance the mission of the organization. A strong base of knowledgeable end users that significantly improve the efficient use and internal support of the EHR. The distributed model of support also clearly defines what areas of support should be assigned to other IT staff (or subcontractors). This illustrates the basic structure of a distributed governance and support model. A description of each of these areas/teams follows. Successful EHR implementations involve many areas of the healthcare organization. Clinical services, quality assurance, finance, and information technology (IT), all have an investment in the approach to system implementation. These same groups have a stake in the ongoing management of the EHR as well. The configuration and management of the EHR continue post-implementation to meet program growth, changing clinical requirements, new billing/payer rules, integrated health initiatives, and more. During and after implementation, it is essential that the organization maintain an EHR steering committee. The steering committee should be composed of a cross-functional group of the organization’s leaders. The Steering Committee oversees the implementation and ongoing enhancements of the EHR. The steering committee’s initial work is very focused on the details of implementation. Post implementation, the committee’s work shifts to managing priorities, timelines and maintaining standardization across the organization. The steering committee’s role is to make decisions about how the EHR will be managed and implemented throughout the organization. This is particularly important in large multi-service organizations where implementations are often staged in multiple phases. The requested project has a defined return on investment (ROI); whether it be in improved clinical outcomes, productivity, system compliance, or another critical objective. The EHR work plan is manageable within the resources (human and financial) that the organization has allocated. The cross-functional steering committee ensures that all primary areas of the EHR get considered when priorities and decisions get negotiated. Many organizations have only a small number of staff to manage the implementation and provide ongoing support of the EHR. As a result, it is essential to carefully review the staff functions in your IT department and define what role these staff play in supporting the system. Also, experienced end users can play a significant role in supporting the EHR. These teams are composed of a cross-functional group of EHR end users who have become subject matter experts. Depending on the size of your organization, you may have one or more teams. Operations teams often focus on a specific program area (e.g., outpatient, residential, or community-based services). In large agencies that provide one type of service (outpatient mental health), these teams may represent specific geographic regions. 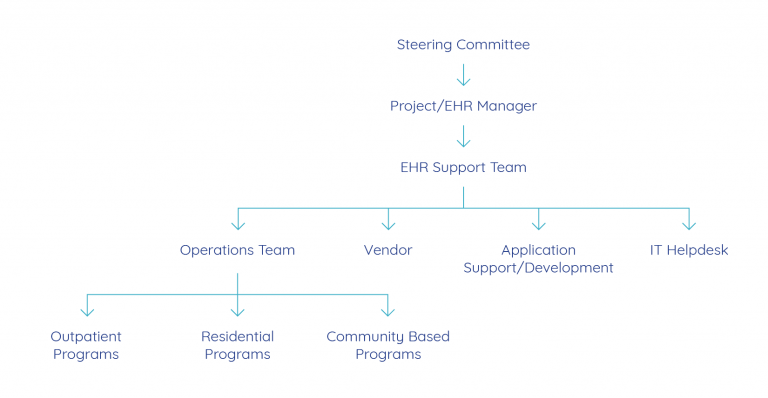 The operations team is led by the EHR Project Manager and serves as the first level of support for users in their program or geographic area. Users who need help on how to use the EHR for their program will get direct assistance from a member of the associated operations team (often referred to as “super users”). Technical problems are escalated to other areas of the distributed support team as needed. In addition to daily user support, operations team members work collaboratively with the EHR Project Manager to create and maintain all user manuals. Team members are also responsible for training new users in their program area. Finally, operations team members are engaged in reviewing new system capabilities that the EHR vendor releases in software upgrades as well as related user acceptance testing. It is essential to have in place clear direction for end users on whom to call for assistance with the EHR; who to call for technical issues such as a password reset versus support understanding a workflow. A “super user” for their program is an EHR functionality resource. When users are experiencing problems with the system, such as system freezes, error messages, or reduced performance/speed, these issues should be reported to your organization’s IT Helpdesk. The helpdesk staff should then triage issues to determine if they may need further escalation to the organization’s technical team, vendor or EHR manager. Organizations must have a defined plan for ongoing EHR application development and custom reporting. The resources needed (experienced analysts and programmers) for this function are dependent on the architecture of your EHR and the tools that are made available for expanding the functionality (e.g., building new assessments, or adding new billing rules). Additionally, report writing is often overlooked in planning for resources to support the EHR. Most organizations will need some level of custom reporting to support their unique requirements beyond what is available with out-of-the-box reporting. It is particularly important to plan for report writing during implementation as an ongoing resource post go-live. When defining your organization’s application support approach, you will need to consider if you will depend on the vendor, another contractor, internal resources, or a combination of those to complete this work. When implementing an EHR, the development of a robust support model is key to the success, accuracy, and consistency of system use. Most organizations do not have the resources to employ staff with the sole responsibility for the deployment, training, and management and support functions of the EHR. As a result, it is crucial to engage available resources and staff to take responsibility for these tasks. Creating a distributed support model that engages and empowers end users and system “owners” to work collaboratively with IT to support the EHR is exceptionally useful. This model encourages a dynamic EHR deployment and support model which results in continuous improvements and expansion in the use of the EHR across the organization.